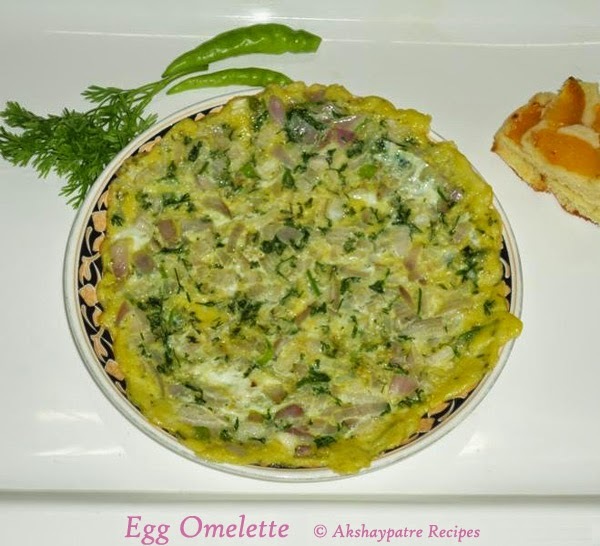 Egg omelette recipe - Egg omelette is a hassle free snack or dish that I make often. It is convenient to carry in the lunch box too. Fresh, hot omelette goes great with bread slices as sandwich. 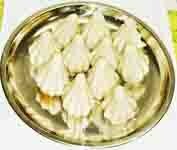 It is also served as a side dish along with any main course.It can also be eaten as it is. Because of it's simplicity, versatility, and taste, it has become favorite part of our diet. Many like it for this reason. Now, I'm explaining here about proteins (in eggs) and cholesterol in short. Protein is the most important nutrient required to build and repair our system. It also satisfies the hunger without adding fat or calories. Egg yolk (yellow part) contains cholesterol and no protein. If you want to avoid fat and cholesterol, you can avoid using egg yolk. But, egg white contains all of the proteins of an egg and it has no cholesterol. It means egg white is very good for health. Here is the simple version of my omelette that even a small child can do it. Note that you can add vegetables like carrot, capsicum, cabbage, mushroom, etc. to it. Mix together the onion, green chilly and coriander leaves in a large bowl. Beat the eggs and add to it. Add salt and chilly powder. Whip the mixture until light. Flip the egg omelette and cook from another side too. Serve the egg omelette hot with bread slices. 1. Combine together the chopped onion, chilly and coriander leaves. Beat the eggs, add and whip it. 2. Heat a non-stick griddle and apply oil on it and spread the egg mixture and spread it to a round shape. 3. Cook it on medium flame until the base becomes firm.Flip it and cook from another side too. 4. 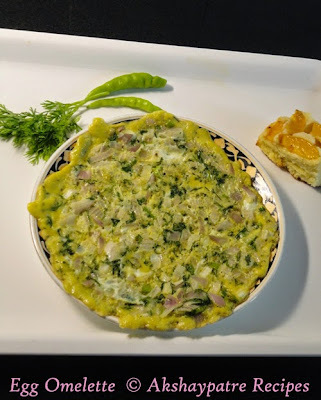 Serve the egg omelette hot with bread slices.